If you have a number of existing contacts that you wish to tag, you can do so using the import/export tool. Navigating to the Classic Import Tool. Exporting your current contacts to an .csv file. Update the .csv file with the tags in the correct format. Import the .csv file with the latest updates. 1. Click the Gear icon and choose Preferences. 2. 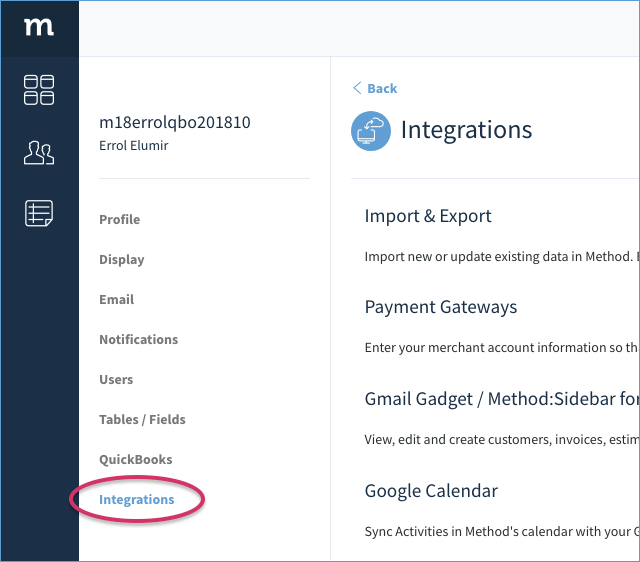 On the left menu, select Integrations. 3. Click Launch Import & Export. 4. Select Use our Classic Import Tool. 1. Select Export a table to a file. 2. 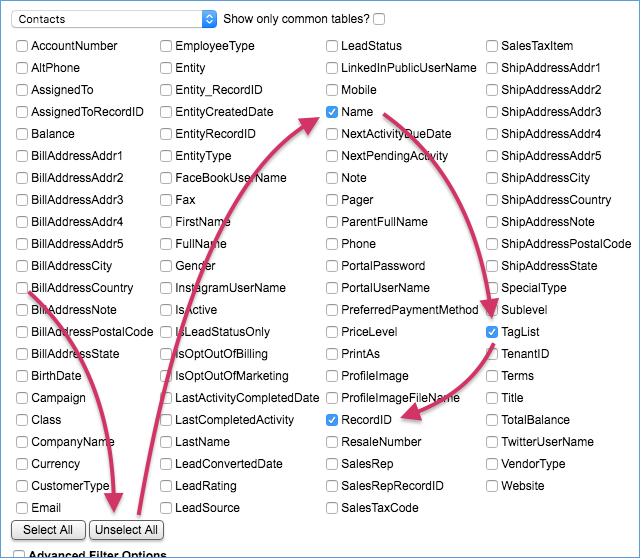 Uncheck "Show only common tables" and select the Contacts table. With the file you downloaded above from the Import/Export tool, you can update the Taglist column to add in tags. Below is an example .csv file loaded into Google docs. The TagList column holds the tags. Tags are separated by commas. If you have spaces in your tags, replace it with an underscore "_". The tag should exist in Method before adding. Add the tag to Method before importing this list. Any contact you don't need to update, you can remove from this list. Once you are finished adding tags, export the file as a new .csv file and go to the next section. You should now be ready to update the data back into Method. You will need your updated .csv file you created above. Return to the Classic Import tool in Method. Select Import into a table from a file. Uncheck Show only common tables? Select Contacts table in the dropdown. Select Choose File and browse for your updated .csv file. Click Import Data. This will take you to... Import - Step 2: Prepare Data. For "2. Set options:" select Update existing record by matching key fields. Make sure RecordID is also checked. Scroll to the bottom and click Import Data. Click Begin Import and wait for the progress bar to reach 100%. Congratulations! Your contacts will now be updated with new tags!